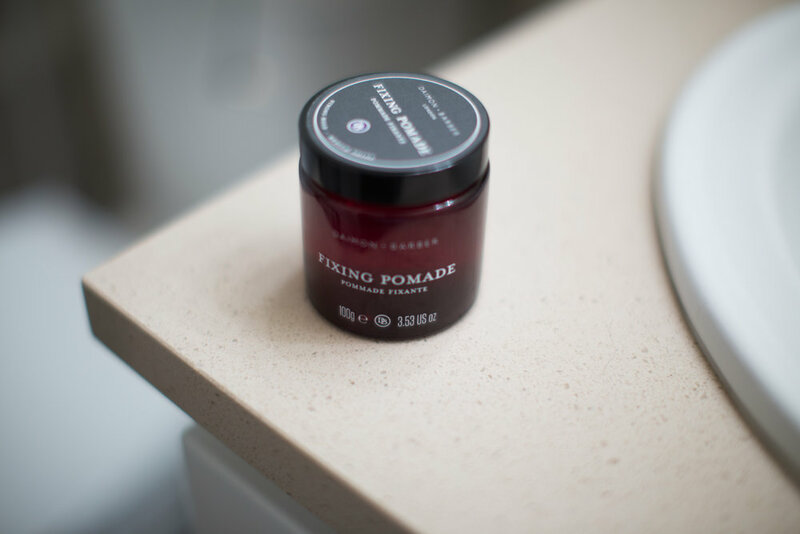 Today, we're continuing down the new line from Daimon Barber and seeing what they have to offer in their new Fixing Pomade. It's a gel-pomade that's marketed as strong hold and medium shine. That sounds like nothing new, but we will look deeper and really see if there's anything unique about this particular one from London. Luckily, there is. The design language is pretty consistent across their entire line -- whether it is a hair pomade jar or a tube of face wash. It's clean and simple. I like it, but thinking about it now, it's still very conservative. There clean and simple in the Aesop sense which is progressive and the peak of design aesthetic while these jars and tube still confine themselves to standard formatting. The fragrance of this pomade is amazing. Officially, it's some combination of oudh and Egyptian mallow, but in plain English, it has a feeling of floralness on the top but with a deepness that makes it all real. This one is a little hard to explain, but it is very damn nice. The way it feels in the jar an my palms remind me of Imperial Gel Pomade -- just not quite as soft. Still, it's more similar to that than any other gel-pomade. That consistency makes it very easy to apply. Also, it doesn't seem to dry as quickly as some others in its same category which furthers the ease of application. I'd put it barely above neutral. Later in the day, it'll eventually just end up being neutral. This is the case for the large majority of gel-pomades. Fixing Pomade has pretty average slickness. 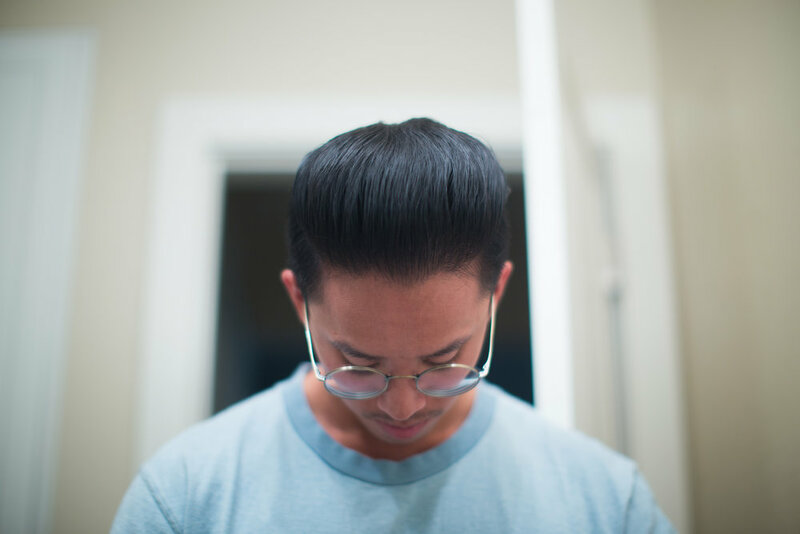 Normally, this makes it just slightly difficult to style a clean pomp, but rather than a slickness, there's a dry stickiness (kinda like what you find with clay pomades) that helps to keep it all together. 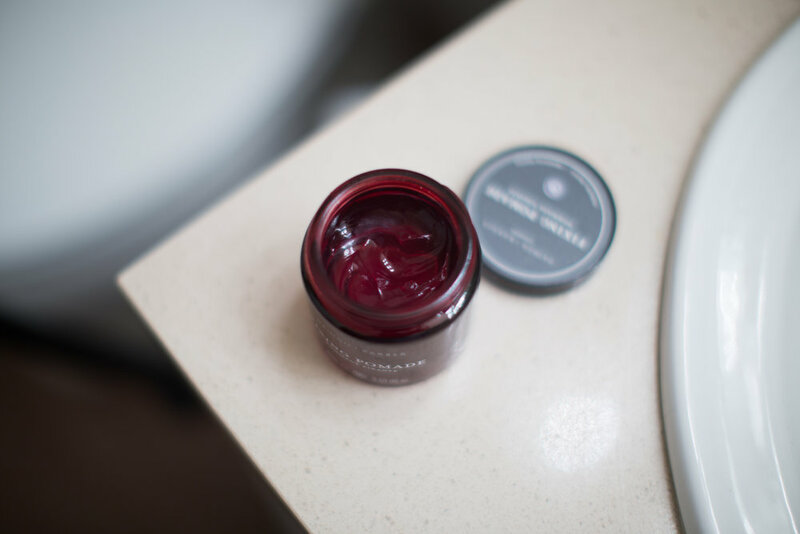 The raw hold of this pomade is something between a medium or firm. Maybe more towards medium. However, the weight and feeling of this product is almost nonexistent. This helps you make full use of the strength it offers. But again, that strength is limited and is not brutal which helps prevent the wedge head scenario. All together, this makes a fineeeeee gel-pomade as is demonstrated by the photos below. You should be able to make quick work of your hair with it. 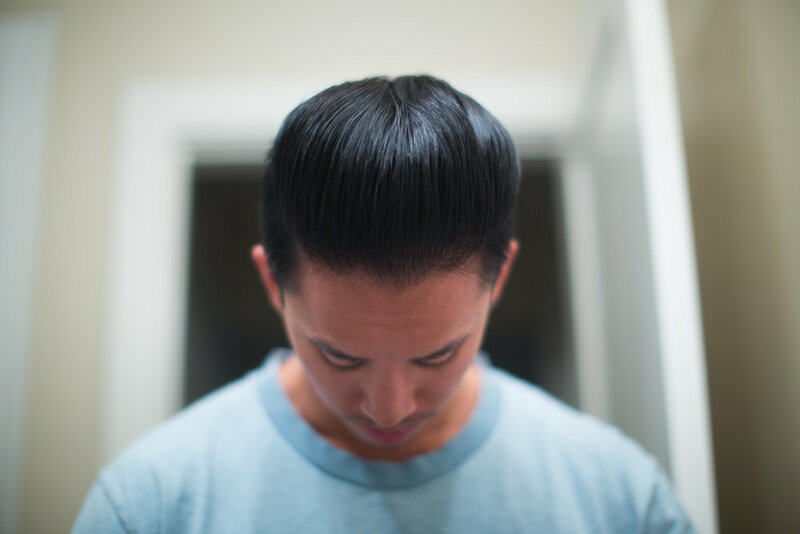 Plus, an advantage for me with this pomade is that it calmed my sides. Typically and especially with gel-pomades, water excites my hairs and cause them to stand -- making it difficult to slick my sides. 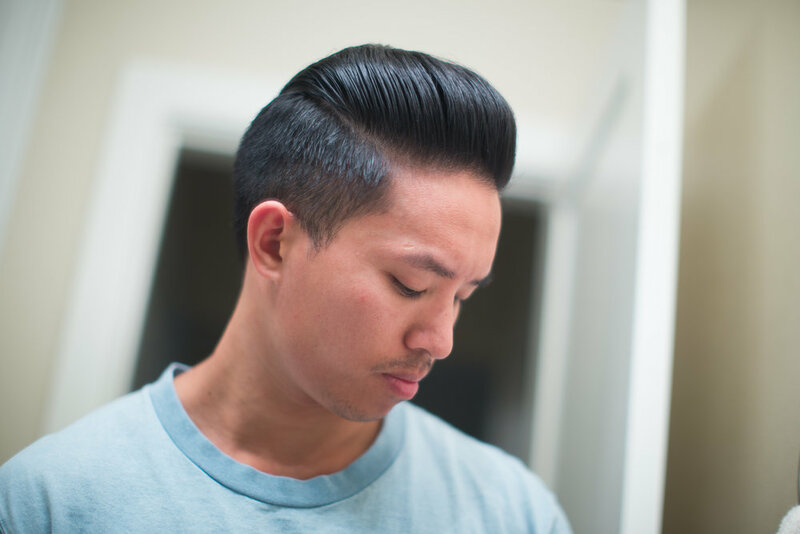 This was not the case with Fixing Pomade which was very unexpected from a gel-pomade. Below average in comparison to other gel-pomades, but at the same time, I actually never got a helmet head from this gel-pomade. I'm not saying it doesn't dry over time. Instead, I'm saying that it doesn't necessarily harden significantly or at least, to the extent other have. While being a sacrifice to the resilience of the pompadour, it is a lot more convenient to manage and rework during the day. Small corrections can be done on the fly during the day, but major rework requires water which does fantastically to reactivate the product. It dries but never to a discomforting extent. It's been a while since we've seen a gel-pomade that can make itself stand out among a myriad of similar products. The Daimon Barber Fixing Pomade receives my seal of approval because so many of its characteristics seem counterintuitive yet they help to make this product even better. Its dryness helps to keep my hair calm while styling. The smell is amazing. It doesn't harden much but leaves the ability to restyle during the day. 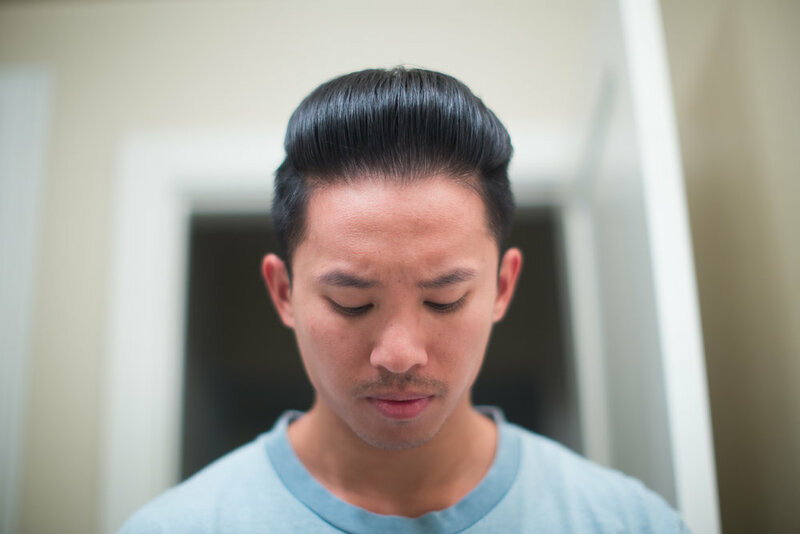 For those of you who secretly opt to use gel-pomades, I would consider this one worth trying. If you're interested in Fixing Pomade or any of Daimon Barber's other products, we can provide you with promo code THEPOMP to save 10% off your order. They've finally established a warehouse here in the US, so rejoice for the faster (and cheaper) shipping options.